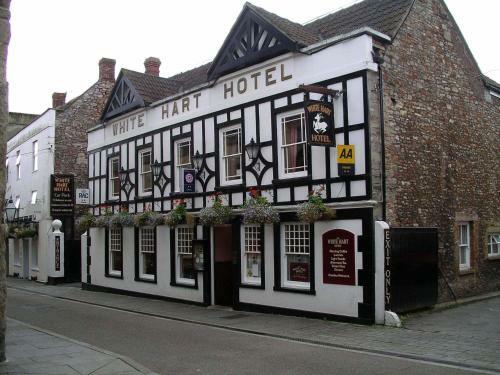 The 15th Century White Hart Hotel enjoys a hugely desirable location in Wells – one of the prettiest (and smallest!) Medieval cities in England. Just around the corner from Cathedral Green and just yards away from the ancient Market Place. What we have up for grabs here is a fab-looking Tudor Coaching Inn in Central Wells. Don’t let the classic black and white Tudor exterior fool you though, as there is a pretty progressive attitude to both the design and management of the property. The 15 hotel bedrooms are offered as double and twin en suites and feature a trove of modern amenities including free-wireless broadband and complimentary mineral water and biscuits. However, the real selling point is the restaurant. Brufani’s Steak and Gourmet Burger Restaurant has acquired something of a cult status in Wells and the beef is sourced from the local fields in Priddy. The gourmet burgers are all homemade but there are vegetarian options also available. There is also an open log fire which is especially welcoming in Winter. Ample parking is available.